Organic Futures Aotearoa is a privately owned limited liability company. 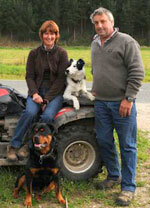 It was established in 2009 and its purpose is to service the organic producers of food and wool. sourcing and supplying stock food and supplements. Organic - what does this mean? The stock, seeds, feed, food and fibre we supply and market are all certified as organic by a certification authority - either Organic Farm New Zealand, Bio-gro or AsureQuality. are produced by ethical and environmentally sustainable practices of farm management. Organic Futures is dedicated to economic as well as environmental sustainability for organic production and processing. Our fees are negotiable but generally reflect the input required from Organic Futures to match prime producers with prime markets. This is the beautiful land we call New Zealand, the “nutrient dense” food bowl of the South Pacific. For the organic farmers we service it is a place where the air is fresh, the streams are clean, the views are three-dimensional - and dreams come true. The Organic Futures group currently consists 30 sheep and beef farms in the South Island committed to supplying beef and lamb to Organic Futures. Our beef is from predominantly Angus and Hereford stock. It is selected for prime quality and supplied 12 months of the year.